A total of 31 leatherback turtles known as giant turtles, the world explorers, landed and laid eggs in Yenbekaki village, Raja Ampat Regency, West Papua, throughout 2018. 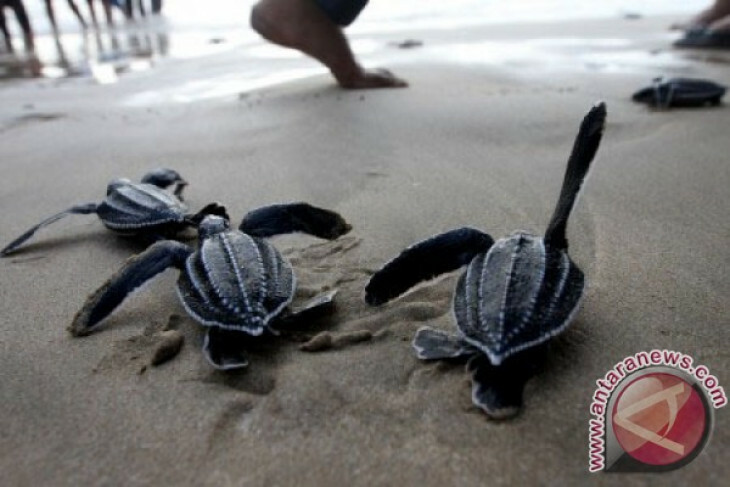 Yenbekaki Village Turtle Conservationists Group noted that in May 2018 eight leatherback turtles landed and lay eggs in the Warebar Beach area, Yenbekaki village. Then in June there were five, in July there were eight, in August there were three, in September there were three, and October as many as four, so a total of 31 giant turtles landed and laid eggs in Yenbekaki village. Chair of Kampung Conservation Activist Group Yenbekaki Yusuf Mayor in Waisai, West Papua, Monday, said that as many as 31 leatherback turtles landed in the Warebar Coast area throughout 2018, laying 3,706 eggs. He said the community activists for the conservation of the village of Yenbekaki turtles were guarding the Warebar Beach area where the giant turtle nest was from the attack of predators targeting their eggs. He explained that out of a total of 3,706 leatherback turtle eggs, 1,000 were damaged and 2,706 were successfully hatched into hatchlings. Community activists for the conservation of the village of Yenbekaki turtle breed the turtle hatchlings to avoid predatory attacks. According to him, captivity to hatchlings is carried out no later than two weeks after the eggs hatch. So that the hatchlings are really strong and can avoid the attack of the predator then released into the sea. “The work of the community activists for the conservation of the Yenbekaki village of Raja Ampat, throughout 2018 managed to release 2,706 giant turtle hatchlings into the sea,” he said.